Background: Acute myeloid leukemia (AML) is characterized by an excess number of myeloid cells in the marrow with maturation arrest and infiltration of bone marrow (BM) and other tissues by myeloblasts, resulting in BM failure. Objectives: The main goal of the present study is to investigate CD200 and CD56 aberrant expression in CD34-positive blasts, in newly diagnosed adult AML patients and their relation with the clinical and hematological parameters, as well as to identify their prognostic significance after induction therapy. Materials and Methods: This was a prospective cross-sectional study on thirty patients with newly diagnosed AML, who were tested for the expression of CD200, CD56 using multicolor flow cytometry and re-evaluated after induction therapy regimen. 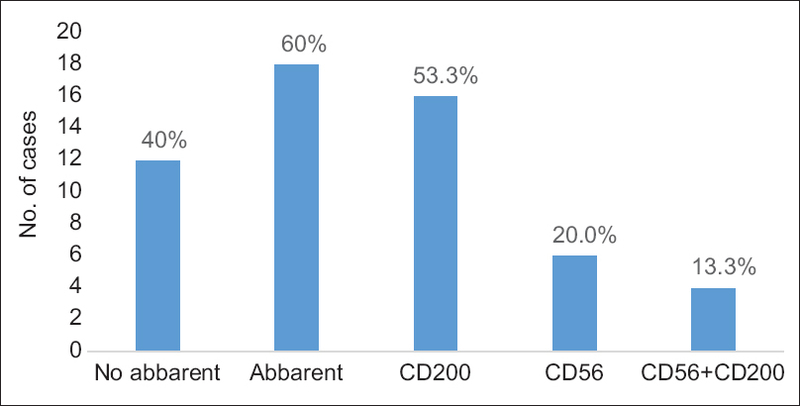 Results: CD200 and CD56 were aberrantly expressed in 53.3% and 20.0%, respectively, while coexpression of both markers was observed in 13.3%. Interestingly, both markers were expressed more in monocytic subtypes. Significantly, the induction failure in CD200 + patients was 75%, while it was 66.7% in CD56+ patients. Conclusion: The findings of this research provide insights that CD200 and CD56 were closely related to bad prognostic parameters, including high total white blood cell count, low platelet's counts, and low response to induction therapy. Malignant proliferation of myeloid progenitor cells that gradually replace normal hematopoiesis in the bone marrow (BM) is known as acute myeloid leukemia (AML). AML accounts for approximately 80% of acute leukemia (AL) in an adult. Clinically, patients presented with signs or symptoms of BM failure although signs of leukostasis or neurological dysfunction may be present. The etiology of majority of AML cases remains unexplained. However, many hematological disorders such as myeloproliferative or myelodysplastic disorder and aplastic anemia may represent predisposing factors in minority of cases. Genetically, AML resulted from multistep of collaborating mutations in hematopoietic precursors; two hits model is implicated in leukemogenesis: Class 1 includes mutations which activate signal transduction pathways resulting in enhanced proliferation and/or survival of leukemic progenitor cells. Class 2 include mutations that affect transcription factors or components of the transcriptional coactivation complex. Gain of antigens not normally expressed by cell type or lineage such as CD7 expression on myeloid blasts cells. it is a cell surface glycoprotein, expressed normally on broad range of cells such as dendritic cells, macrophages, mast cells, neutrophils, and also B- and T-cells., CD200 plays vital role in maintaining self-tolerance and autoimmunity. Its binding with CD200R leads to induce an immunosuppressive signal which favors the tumor growth. Initially, CD200 was reported in chronic lymphocytic leukemia (CLL), where it has a role in differential diagnosis of mantle cell lymphoma. CD200 is normally not present on plasma cells; on the other hand, plasma cell myelomas (PCMs) expressed CD200 in more than 70%, while loss of CD200 expression in PCM may be associated with more clinically aggressive disease. In AML, CD200 aberrant expression has been proposed as bad prognostic factor, may be due to suppression of natural killer (NK) activity, its overexpression associated with a worse prognosis even with the presence of favorable biological markers, such as Flt3 wild-type, mutated nucleolar protein nucleophosmin and negative expression of CD34 and CD56. CD56 antigen expression in AML with favorable prognosis such as in t (8;21), may impact on complete remission duration and extramedullary manifestations. Incidence of central nervous system disease is highly associated with CD56 antigen especially in patients with AML, myeloid/NK AL, acute lymphocytic leukemia, and lymphoma. This can be attributed to the important function of CD56 in neuronal growth and migration through cell-to-cell adhesion. it is a glycoprotein, expressed commonly on hematopoietic progenitor cells; it acts as a cell–cell adhesion factor. CD34 antigen is present on both myeloid and lymphoid leukemic cells. It has an important role in identification of blasts in hypoplastic marrows to differentiate myelodysplastic syndrome (CD34+ blasts present) and AL from aplastic anemia (no blasts/low marrow CD34+ cells) and also to determine disease processes or vascularization of tumors. This cross-sectional study was conducted on thirty adults newly diagnosed de novo AML patients from January 2017 to June 2017. This study was approved by the Ethical Committee at the College of Medicine/Al-Nahrain University. Patients were taken from the Hematology Department of Baghdad Teaching Hospital of the Medical City and Al-Imamein Kadhimein Medical City. Written consent was taken from the patients before starting the study. Diagnosis was based on morphology and cytochemistry (Sudan Black and periodic acid–Schiff) of the peripheral blood (PB) and/or BM aspiration samples by an expert hematopathologist; suspected cases were sent for flow cytometric study to confirm diagnosis. 2.5 ml of ethylenediaminetetraacetic acid blood specimens was transferred to a cool box (within 6 h) to a private laboratory to investigate the expression of surface marker antigens (CD200, CD56, and CD34) using four-color flow cytometer (Partec Cyflow ® Cube 6, Germany). For gating, we depend on forward scatter/side scatter gate. The device software is based on the Windows TM operating system for multiparametric data acquisition, display, data analysis, and instrument control. Antigen expression was considered to be positive when the percentage of positive blast cells was ≥20%. After 3–4 weeks, PB and BM aspiration were collected from the patients to assess their response after induction therapy. All patients were evaluated for CR achievement. CR was defined by Cheson et al. ; patients were classified into CR (BM blasts <5%; absence of blasts with Auer rods More Details; absolute neutrophil count >1.0 × 109/L; and platelet count >100 × 109/L), resistant disease (persistent leukemia by blood and/or BM examination), and death during induction. In the present study, M3 subtype of the French-American-British (FAB) classification was excluded to decrease bias due to CD34 expression. Statistical analysis was performed using Microsoft Excel and GraphPad Prism 6. Categorical data formulated as count and percentage. Chi-square test describes the association of these data. Numerical data with normal distribution was described as mean and standard deviation (SD), independent sample t-test used for comparison between two groups. While for abnormal distribution, Mann–Whitney test used for comparison between two groups. The lower level of accepted statistical significant difference is bellow or equal to 0.05. In the current study, functional connectivity was done to detect the aberrant expression of CD200 and CD56 in adult AML patients. The mean age of the patients was 40.93 ± 15.63 SD years, with a median of 38 years; the range was 17–76 years. Fifty-three percent of the cases were in the age group of 21–40 years. AML was observed more in males than in females with male:female ratio of 3:2. The two most frequent signs were pallor and fever (60% and 46.7%, respectively). The classification was applied after excluding M3 subtype; M2 subtype was the major portion of the AML subtypes (36.7%), followed by M5 (26.7%), M1 (20%), M4 (13.3%), and M7 (3.3%). Regarding aberrant expression, CD200 was expressed in 16 out of 30 cases (53.3%) and CD56 was expressed in 6 out of 30 cases (20%), whereas simultaneous co expression of both markers was detected in 4 out of 30 cases (13.3%) [Figure 1]. Regarding relation of both aberrant markers with classical prognostic parameters, high white blood cell (WBC) above 30 × 109/L and moderate low platelet count (33.19 ± 13.46 × 109/L) were significantly related to aberrant CD200 expression. Similarly, CD56 expression was significantly related to high WBC above 30 × 109/L and very low platelet count (25.83 ± 7.19 × 109/L) as well as high PB and BM blast percentage [Table 1]. CD200 expressed more in cases with monocytic differentiation, it was found in M5 as 6 out of 8 cases (75%) and in all four M4 cases (100%). On the other hand, CD56 was expressed in monocytic subtypes in M5 as 2 out of 8 cases (25%) and in M4 as 2 out of 4 cases (50%). In all AML patients included in this study, CR was achieved in 14/30 patients (46.6%) at the end of induction therapy. Twelve out of 16 patients (75%) who express CD200 did not respond to induction therapy (P < 0.005). On the other hand, four out of six cases (66.6%) who expressed CD56 did not respond to induction therapy (P > 0.005) [Table 2]. The mean age and range of AML patients included in this study were 40.93 ± 15.63 (mean ± SD) years and 17–67 years; those results were in accordance to Iraqi ,, and non-Iraqi studies. Furthermore, AML was observed more in male than in female, with a male:female ratio of 3:2, which was in consistent with that reported by the Iraqi Ministry of Health. The most common presenting features for adult AML were pallor and fever, while lymphadenopathy and gingival hypertrophy were the least presenting features. Those findings were in agreement with Iraqi  and other worldwide studies. Moreover, M2 subtype was found to be the most common FAB subtype (36.7%) in accordance with Alwan et al., who found that M2 (38%) most frequent subtype. The present study revealed that CD200 was expressed in 53.3%, approximately similar to Damiani et al. and Tiribelli et al., who reported that CD200 expression was found in 49% and 48%, respectively. However, CD56 was expressed in 20% of cases, which was comparable to the result obtained from El-Sissy et al., who reported that CD56 was expressed in (20.3%). CD200 aberrantly expressed more in monocytic subtypes (M4–M5) which was 10 out of 12 cases (83.3%),, followed by M1–M2 subtypes as 6 out of 17 cases (35.2%). Regarding CD56, it was more expressed in monocytic subtype as four out of 12 cases (33.3%); this was in agreement with Di Bona et al. and Graf et al. Regarding extramedullary manifestations which include (hepatosplenomegaly, lymphadenopathy, and gingival hypertrophy), CD200 was positively expressed in 6 out of 9 cases. To the best of our knowledge, no previous studies addressed the correlation of the extramedullary infiltrates with CD200 expression. While CD56 expression was positively expressed in 4 out of 9 cases, this result was consistent with that obtained by Chang et al. Since both markers were expressed more in monocytic subtypes with the presence of extramedullary manifestations, they will confirm the unfavorable role of both markers. However, this study showed that there was no significant correlation between both markers and patient's age whether above or below 60 years and gender. Regarding the hematological parameters, CD200 was observed more in cases with WBC count ≥30 × 109/L than those <30 × 109/L in comparable to Damiani et al., Furthermore, CD200 was significantly expressed in cases with low platelets count; this was in agreement with other study on hematological malignancies such as CLL. The present work did not reveal any significant differences in CD200 expressions with respect to the PB and BM blasts percentage. To the best of our knowledge, no previous studies addressed the correlation of the PB blasts and BM blasts percentage with CD200 expression. Variation in the relation between CD200 expression and hematological parameters can be explained by the direct interaction between CD200-positive cancer cells and myeloid cells, which can be attributed to the high expression of CD200R on tumor-associated myeloid cells which is considered as a source of many soluble factors and enzymes such as vascular endothelial growth factor, tumor necrosis factor-alpha, interleukin (IL)-1 β, IL-6, transforming growth factor beta, IL-10, and nitric-oxide that had variable effect on hematopoietic cells. In the current study, CD56 was significantly more expressed in cases with WBC ≥30 × 109, in comparable to the result obtained from Iriyama et al., who found that WBC count was higher in CD56-positive cases but does not reach the significant level. In concerning to the relation between CD56 and CR, there were 4 out of 6 cases (66.6) expressing CD56 being achieved complete response to induction therapy (P = 0.657), which is comparable to Raspadori et al. In the present study, the all four cases who coexpressed both CD200 and CD56 did not achieve CR; this clarifies the bad prognostic impact of both markers on AML patients when coexpressed together. CD200 and CD56 expressions were detected in 53.3% and 20% of adult AML cases, respectively. CD200 and CD56 were expressed mostly in monocytic AML subtypes. Both markers were closely related to bad prognostic parameters including high WBC and low platelets count. Whereas high peripheral blood and bone marrow blast count and extramedullary manifestations where mostly presented with CD56 positive AML cases. In view of close association of both markers expression with low response to induction therapy, thus we may propose that both markers expression particularly CD200 in AML patients; could be regarded as an auxiliary poor prognostic marker. Yin F, Malkovska V. Acute myelogenous leukemia. In: Rogers G, Young N, editors. The Bethesda Handbook of Clinical Hematology. 3rd ed. Philadelphia: ULW & W; 2013. p. 137-56. Therapy of Acute Myeloid Leukemia; 2012. Available from: https://www.intechopen.com/books/myeloid-leukemia-clinical-diagnosis-and-treatment/therapy-of-acute-myeloid-leukemia. [Last accessed on 2017 Mar 06]. Bain BJ, Matutes E. Acute myeloid leukaemia. In: Myeloid Malignancies: An Atlas of Investigations and Diagnosis. Oxford: Clinical Publishing; 2010. p. 7-56. Döhner K, Döhner H. Molecular characterization of acute myeloid leukemia. Haematologica 2008;93:976-82. Craig FE, Foon KA. Flow cytometric immunophenotyping for hematologic neoplasms. Blood 2008;111:3941-67. Bain BJ. Leukaemia Diagnosis. 5th ed. UK: Blackwell Publishing; 2017. Tonks A, Hills R, White P, Rosie B, Mills KI, Burnett AK, et al. CD200 as a prognostic factor in acute myeloid leukaemia. Leukemia 2007;21:566-8. McWhirter JR, Kretz-Rommel A, Saven A, Maruyama T, Potter KN, Mockridge CI, et al. Antibodies selected from combinatorial libraries block a tumor antigen that plays a key role in immunomodulation. Proc Natl Acad Sci U S A 2006;103:1041-6. Damiani D, Tiribelli M, Raspadori D, Sirianni S, Meneghel A, Cavalllin M, et al. Clinical impact of CD200 expression in patients with acute myeloid leukemia and correlation with other molecular prognostic factors. Oncotarget 2015;6:30212-21. Alapat D, Coviello-Malle J, Owens R, Qu P, Barlogie B, Shaughnessy JD, et al. Diagnostic usefulness and prognostic impact of CD200 expression in lymphoid malignancies and plasma cell myeloma. Am J Clin Pathol 2012;137:93-100. Raspadori D, Damiani D, Lenoci M, Rondelli D, Testoni N, Nardi G, et al. CD56 antigenic expression in acute myeloid leukemia identifies patients with poor clinical prognosis. Leukemia 2001;15:1161-4. Alegretti AP, Bittar CM, Bittencourt R, Piccoli AK, Schneider L, Silla LM, et al. The expression of CD56 antigen is associated with poor prognosis in patients with acute myeloid leukemia. Rev Bras Hematol Hemoter 2011;33:202-6. Yang DH, Lee JJ, Mun YC, Shin HJ, Kim YK, Cho SH, et al. Predictable prognostic factor of CD56 expression in patients with acute myeloid leukemia with t(8:21) after high dose cytarabine or allogeneic hematopoietic stem cell transplantation. Am J Hematol 2007;82:1-5. Nielsen JS, McNagny KM. Novel functions of the CD34 family. J Cell Sci 2008;121:3683-92. Raspadori D, Lauria F, Ventura MA, Rondelli D, Visani G, de Vivo A, et al. Incidence and prognostic relevance of CD34 expression in acute myeloblastic leukemia: Analysis of 141 cases. Leuk Res 1997;21:603-7. Induction Chemotherapy. Available from: http://www.reference.md/files/D060/mD060828.html. [Last accessed on 2017 Mar 21]. Flow Cytometry. Available from: https://www.sysmex-partec.com/products/flow-cytometry.html. [Last accessed on 2017 Apr 14]. Cheson BD, Bennett JM, Kopecky KJ, Büchner T, Willman CL, Estey EH, et al. Revised recommendations of the International Working Group for diagnosis, standardization of response criteria, treatment outcomes, and reporting standards for therapeutic trials in acute myeloid leukemia. J Clin Oncol 2003;21:4642-9. Muhsin SY. Expression of Aberrant Antigens CD7 and CD19 in Adult Acute Myeloid Leukaemia by Flow Cytometry. A Thesis Submitted to the Scientific Council of Pathology in Partial Fulfillment for the Requirements for the Degree of Fellowship of the Iraqi Committee for Medical Specializations in Pathology/Hematology; 2013. Al-Fatlawi HH, Musa RJ. Evaluation of CD96 and CD123 in CD34+ leukemic stem cells in acute myeloid leukemia patients and their relation to response to induction therapy. Iraqi J Hematol 2016;5:161-6. Gari M, Abuzenadah A, Chaudhary A, Al-Qahtani M, Banni H, Ahmad W, et al. Detection of FLT3 oncogene mutations in acute myeloid leukemia using conformation sensitive gel electrophoresis. Int J Mol Sci 2008;9:2194-204. Ministry of Health. Iraqi Cancer Registry: Leukemia Statistic of the Year 2011. Iraq: Iraqi Cancer Board; 2011. Alwan AF, Zedan ZJ, Salman OS. Acute myeloid leukemia: Clinical features and follow-up of 115 Iraqi patients admitted to Baghdad Teaching Hospital. Tikrit Med J2009;15:1-8. Hu R, Wu Y, Jiang X, Zhang W, Xu L. Clinical symptoms and chemotherapy completion in elderly patients with newly diagnosed acute leukemia: A retrospective comparison study with a younger cohort. BMC Cancer 2011;11:224. Tiribelli M, Raspadori D, Geromin A, Cavallin M, Sirianni S, Simeone E, et al. High CD200 expression is associated with poor prognosis in cytogenetically normal acute myeloid leukemia, even in flT3-ITD-/NPM1+patients. Leuk Res 2017;58:31-8. El-Sissy AH, El-Mashari MA, Bassuni WY, El-Swaayed AF. Aberrant lymphoid antigen expression in acute myeloid leukemia in Saudi Arabia. J Egypt Natl Canc Inst 2006;18:244-9. Harakati MS, Al-Momen AM, Ajarim DS, Al-Moharib FI, Al-Theyab A, Fawzy EM, et al. Adult acute myeloblastic leukemia: Experience at King Khalid university hospital. Ann Saudi Med 1998;18:221-5. El Saghir NS, Ajarim DS, Hall AD, Higgy KE, Al- Mashhadani SS, Al Khairy KS, et al. Adult acute nonlymphocytic leukemia in Saudi Arabia: Experience at King Khalid University Hospital in Riyadh. Annals of Saudi Medicine 1989;9:158-64. Di Bona E, Sartori R, Zambello R, Guercini N, Madeo D, Rodeghiero F, et al. Prognostic significance of CD56 antigen expression in acute myeloid leukemia. Haematologica 2002;87:250-6. Graf M, Reif S, Hecht K, Pelka-Fleischer R, Kroell T, Pfister K, et al. High expression of costimulatory molecules correlates with low relapse-free survival probability in acute myeloid leukemia (AML). Ann Hematol 2005;84:287-97. Chang H, Brandwein J, Yi QL, Chun K, Patterson B, Brien B, et al. Extramedullary infiltrates of AML are associated with CD56 expression, 11q23 abnormalities and inferior clinical outcome. Leuk Res 2004;28:1007-11. Baraka A, Salem HM. Study of CD200 in chronic lymphocytic leukemia. Egypt J Haematol 2012;37:111. Wang L, Liu JQ, Talebian F, El-Omrani HY, Khattabi M, Yu L, et al. Tumor expression of CD200 inhibits IL-10 production by tumor-associated myeloid cells and prevents tumor immune evasion of CTL therapy. Eur J Immunol 2010;40:2569-79. Iriyama N, Hatta Y, Takeuchi J, Ogawa Y, Ohtake S, Sakura T, et al. CD56 expression is an independent prognostic factor for relapse in acute myeloid leukemia with t(8;21). Leuk Res 2013;37:1021-6. Hsiao CH, Tang JL, Yao M, Tsay W, Wang CH, Chen YC, et al. High incidence of CD56 expression and relapse rate in acute myeloid leukemia patients with t(8;21) in taiwan. J Formos Med Assoc 2002;101:393-8. Akagi T, Ogawa S, Dugas M, Kawamata N, Yamamoto G, Nannya Y, et al. Frequent genomic abnormalities in acute myeloid leukemia/myelodysplastic syndrome with normal karyotype. Haematologica 2009;94:213-23. Gattenloehner S, Chuvpilo S, Langebrake C, Reinhardt D, Müller-Hermelink HK, Serfling E, et al. Novel RUNX1 isoforms determine the fate of acute myeloid leukemia cells by controlling CD56 expression. Blood 2007;110:2027-33. Rygiel TP, Meyaard L. CD200R signaling in tumor tolerance and inflammation: A tricky balance. Curr Opin Immunol 2012;24:233-8.